Change in Personal Hygiene: Are there any changes in your loved one's appearance? Perhaps they are not as "put together" as they used to be. Are they wearing appropriate clothing for the weather? For someone who has always taken pride in how they look, this can be especially noticeable and may be a sign that your loved one is having difficulty handling their personal care, grooming and hygiene needs. This may indicate that it is time for companion or home care services. Housekeeping and Care Management: If you are visiting an aging loved one in their home, take a good look around. Is the house clean? Are the floors free of tripping hazards, such as electric cords and throw rugs? Do things look cluttered and/or "piling up"? A look in the refrigerator can reveal a lot. Is there too much or too little food? Be sure to also check medications for expiration dates. Changes in Behavior: Is your loved one acting any differently? Is an outgoing person now withdrawn or vice versa? An individual with memory problems may remove him/herself from social situations for fear they will forget someone's name or say something inappropriate. Unusual outbursts or anger can also reveal fear or even paranoia - a sign of declining mental function. 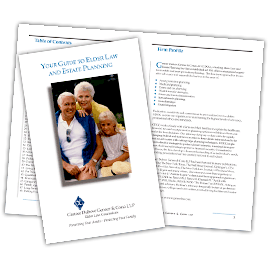 For tips on having the elder care conversation, visit us at www.genserlaw.com to download our free tip sheet: "Elder Care Conversations: Speak with COMPASSION" or call us at 631.390.5000.